› Online protest against austerity: All for nothing? 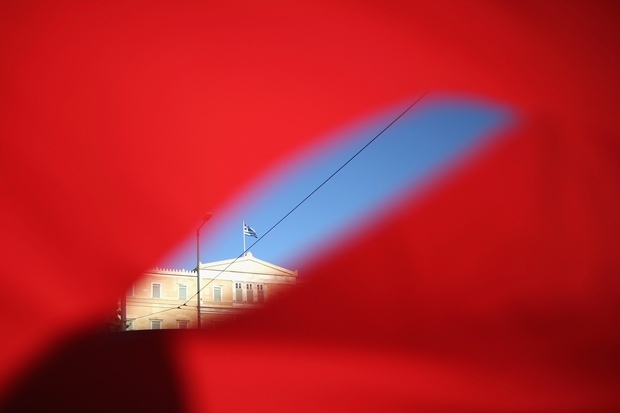 During the Greek crisis, protest has migrated online. But who is listening? Though I have long been an avid user of Twitter, it was never to the point of obsession. Lately, however, Twitter has easily become my go-to resource for all things Greece: It is much faster than the media outlets I usually read, it lets me follow people from different countries and see the different responses to the latest escalation from both a German and a Spanish perspective for example. It has become an invaluable news source for many. And a platform for protest. This morning, as negotiations for the latest bail-out had extended beyond the proclaimed “final deadline“ and into the wee morning hours, protest was rampant. 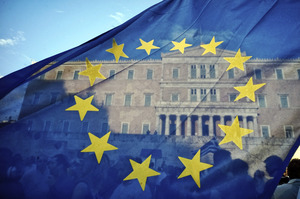 From the leaked details of the negotiation, the new terms appeared to not only be much more drastic than those the Greek electorate had decline a mere week ago. 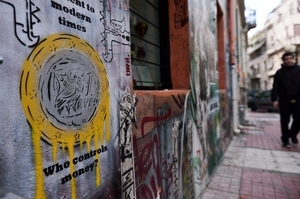 The breakdown of the much-cited “trust“ had turned into draconian measures, including a partial loss of Greek fiscal sovereignty. The country had been asked to transfer billions of its state assets into a Luxembourg-based fund, out of which future obligations were to be paid. Consequently, Twitter was on fire with outrage: The hashtag #ThisIsACoup started trending worldwide, a forum for both disbelief and anger. Of course, one has to take much of the protest with a grain of salt: While much of it includes reasonable and well-articulated opposition to the plans, it does have some dark sides, particularly the rampant comparisons of the German government with the Nazi’s terror reign over Europe. But leaving that aside for a minute, the tag demonstrates the European public’s ability to voice its dissent under a common banner, in a mostly common language (the impact this crisis has had on the adoption of English in European communication warrants a separate article), and in a public, real-time medium. Protest on policies that concern us all are no longer confined to national boundaries; it instead flows across languages and cultures, leveraging modern forms of communication to voice a common concern: That what is happening in Greece is not just undemocratic but short-sighted, vindictive, or even childish. The digital protesters are recognizing a watershed moment for European democracy; they are lamenting the road Europe is embarking on. And yet: They may just remain unnoticed. Because their very public, networked protest stands in harsh contrast to the opaque backroom decisions that have been characterizing this crisis. Their outrage is directed at a political class that isn’t listening, for it spends its time at marathon summits and belongs to a generation mostly disconnected from the very media their citizenry uses to protest. While most politicians can be found on Twitter, their streams are one-directional broadcasts of events, another megaphone to shout into. So while protest might have become networked, the ability to perceive it hasn’t. Much has been made of so-called “slacktivism“, a derogatory term for activists, who take to the net to voice their concern without ultimately impacting it. “Slacktivists“ were accused of merely pandering their ego, i.e. clicking “like“ on the pages of disaster relief funds instead of contributing money – a backlash that wasn’t without justification. But what we are seeing today isn’t “slacktivism“: It is concerned citizens taking to contemporary forms of communication to voice their opposition to the decisions being taken in their name. It is a tragedy that the outcome might also be without impact. Our democracies haven’t kept pace: Suspended in a logic of election cycles, politicians can afford not to listen, for it won’t impact their job security in the short term. Because of that, networked protest rarely reaches the people it intends to reach. It has been a gloomy few weeks for Europe. One that has laid bare the chasm between North and South, big and small economies, and between concerned citizens and the politicians who represent them. I am afraid that this very crisis, resolved with the intention of strengthening Europe, has instead caused all the more apathy towards a political class far removed from its citizens.